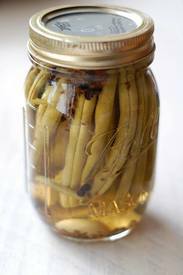 I didn't grow up with dilly beans so I never knew about them until our friend, Ben busted out a jar he'd made and I bit into my first crunchy, garlicky, dilly pickled green bean. I was immediately smitten. Fortunately, my mom-in-law planted way too many bush bean plants this spring and she's practically drowning in beautiful beans. When she brought a huge bag over the other day, I thought DILLY BEANS!! !